U.S. Immigration and Customs Enforcement's (ICE) Homeland Security Investigations (HSI) plays a central role in export enforcement. ICE's Counter-Proliferation Investigations Program, housed under HSI's National Security Investigations Division, has been deeply involved in export enforcement during the past three decades. Executive Order 13558 created the Export Enforcement Coordination Center. The Center strengthens the enforcement of U.S. export laws through the facilitation of partner agency communication and collaboration to keep our nation safe. HSI, as part of the Department of Homeland Security (DHS), manages and operates the Export Enforcement Coordination Center. 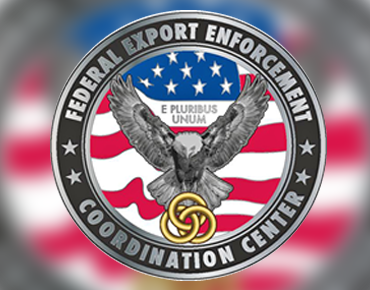 The Export Enforcement Coordination Center serves as the primary forum within the federal government for executive departments and agencies to coordinate and enhance their export control enforcement efforts. The Center maximizes information sharing, consistent with national security and applicable laws. This helps partner agencies detect, prevent, disrupt, investigate and prosecute violations of U.S. export control laws. Serve as the primary forum within the federal government for executive departments and agencies to coordinate and enhance their export control enforcement efforts. The center will also identify and resolve conflicts that have not been otherwise resolved in criminal and administrative investigations and actions involving violations of U.S. export control. Serve as a conduit between federal law enforcement agencies and the U.S. intelligence community for the exchange of information related to potential U.S. export control violations. Serve as the primary point of contact between enforcement authorities and agencies engaged in export licensing. Coordinate law enforcement public outreach activities related to U.S. export controls. Establish government-wide statistical tracking capabilities for U.S. criminal and administrative export control enforcement activities. This will be conducted by the Department of Homeland Security with information provided by and shared with all relevant departments and agencies participating in the Export Enforcement Coordination Center.